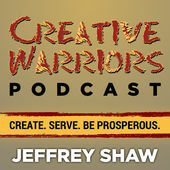 Welcome Creative Warriors Listeners — Creative, Production and You. Welcome. If you are here it is because you heard Jeffrey Shaw and me talking on the Creative Warriors podcast. I hope you had as much fun listening to us as I did talking to Jeffrey. He is a wonderful host who is passionate about business building, leadership and helping to bring out the best in others.